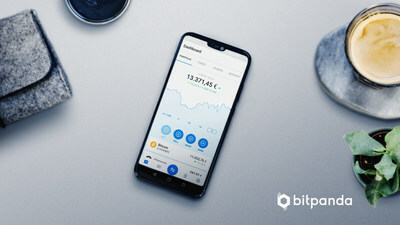 VIENNA, April 4, 2019 /PRNewswire/ -- Vienna-based fintech Bitpanda received a payment service provider license issued by the Austrian financial market authority (FMA) in accordance with European law (PSD2). Bitpanda, the Viennese fintech with around 1 million users and more than 100 employees is expanding its business model. The Austrian financial market authority has granted Bitpanda Payments GmbH, the payment service provider license (PSD2) in accordance with European law after less than 5 months. It is a significant milestone for the Bitpanda group and will allow it to launch exciting features and products in the coming months. "Our goal is to bridge the gap between the modern and traditional financial world. The payment service provider license will allow us to tear barriers down,'' says Philipp Bohrn, one of the two managing directors of Bitpanda Payments GmbH. Prior to joining Bitpanda, Philipp Bohrn was the managing director of the Association of Financial Service Providers in Austria's chamber of commerce for 9 years. Lukas Enzersdorfer-Konrad, former Head of Department Digitalisation and Innovation at Austria's leading banking group Raiffeisen and second managing director, agrees: "We want to act as the missing link to make digital assets spendable anywhere our users want. With the license, we are a first mover in Europe to offer convenient and innovative features and services." "We are very happy that Bitpanda is one of the few European cryptocurrency fintechs to receive such a license. It's a big step towards our vision to create an open, innovative investment-platform," says Bitpanda CEO Eric Demuth. Bitpanda's vision is to provide easy-to-use, convenient access to a vast array of digital assets, and it is currently expanding its trading platform to other asset classes beyond cryptocurrencies. Bitpanda is a fintech based in Vienna, Austria and was founded in 2014. The company has since grown into Europe's leading trading platform for buying and selling digital assets like Bitcoin. Bitpanda has around 1 million users and more than 100 team members. The company is a firm believer in the innovative power of cryptocurrencies and blockchain technology. Their mission is to be the key driving force in the ongoing fintech revolution by providing easy-to-use, safe and trustworthy access to any digital asset for both new and experienced users.